In the woods behind our house we have a Castanopsis cuspidata, or 椎 (Shii) tree. It is one of the largest and most elder trees in our village. It overlooks our house and is on a ridge. Over the years, it has grown more on the side facing the sun and is beginning to stress the tree and is at risk of falling onto our house. The next door neighbor who helps us with our gardening told us that we needed to prune the tree, but that we needed to pay proper respects to the spirit of the tree. We prepared the proper offerings and asked a Shinto Priest to come to perform the ritual. 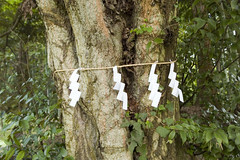 The ritual involved putting a rope with Shinto folded paper around the tree. Then a temporary shrine was set up with the offerings. The priest first called the spirits with a chant and opened the sake and other offerings. We then did a ritual where we were blessed, the tree was blessed and we paid our respects to the spirits. Then there was a closing ritual which ended in drinking sake to toast the home and the tree. I took the salt and rice from the offerings table and sprinkled it around the tree. Immersed in an orchestra of various insects, I stared at our Shii tree for half an hour or so and felt really good. There is something about Shinto ritual that stirs something deep inside. "There is something about Shinto ritual that stirs something deep inside." Sounds really cool, Heidi and I love rituals. We had an old oak tree here at this house a few years back, it was gigantic. There was a big ice storm in Kansas City and sadly, it decided to take most of this wonderful tree with it, we had to take the rest down. We were pretty sad, we had always enjoyed hanging out by the tree, it's massive size offering shade and comfort. I appreciate older things, wondering what secrets and stories they have to share, who might have enjoyed them before I did, what kinds of things happened before I came along. The day before the guys came out to remove the tree, we sat out there, kinda sad, but we knew it was for good reason. The tree was pretty much already gone, but we took lots of great pictures of it, and when I look at them, I miss it very much. Shortly after I left GOL/Exodus, Tokyu Construction decided they had to cut down the 50-year-old cherry tree across the street from my home so that they could build a new bridge across the Oimachi-sen. Somehow the Shinto ceremony to console the spirit of the tree didn't make up for the missing blossoms, but it was better than nothing. The beautiful tree certainly deserved some kind of recognition. It hung over one of the few "Fujimi Hashi" in Tokyo from which you could actually see Mt. Fuji. I have a few of them myself. Very interesting ritual, thanks for sharing that. The tree is a child of the universe just like us. Yet the tree also points to that which is beyond tree, the Creator of trees and all things. I love trees, too. I feel good around them. We have a pine tree behind the garage that the electricity company has pruned one side of, to keep branches away from power lines. But it looks sad to be so lopsided. Yet it carries on, crippled, maimed, but still pointing upward and stretching downward and outward, still a tree. From Eastern thinkers and Native Americans I've learned respect and affinity with nature. From just being a human we should love that which surrounds us. I shall develop my own ritual, or ceremony, when it comes to pruning, clipping, mowing. I always say a little prayer when I mow that I will not hurt, kill, or frighten any little insects. A ritual or ceremony, creepy or occult to some people, can be seen as an attempt to honor and not exploit an item. To contemplate prior to action. Today, we Americans thoughtlessly destroy or contaminate. An absent minded plucking at grass for no reason, just to pluck it. Destruction as unmindful nervous tic. It’s great to hear about the Shinto ritual. Thanks for sharing that. And Shinto is more than fascinating, both its origins and history as much as its belief system and place in the modern society of Japan today. Being a storyteller and designer of worlds ( games , books etc ) my interest for the phenomena’s of the real world as a reference library has always left me hungry. I just can’t get enough. Creating role-playing games for a living for almost 22 years now, I tend to read a lot about religion. It walks hand in hand. Study to be able to create. It was not until my second journey to Japan, many years ago now, that I realised that Japan has something totally unique in terms of religion. This is the only so called civilized country in the world where the old ways of shamanism has survived, and become an organised religion and in that process integrated with the society of a hypermodern country. For those who might not now about it, shamanism was likely the base foundation of all religions, a waste spread belief in the creator, and spirits of the world and the nature. It was seldom organised, because initially there was no great need for this (organisation of religious beliefs or systems often has to do with power and other more earthly needs among the humans) and most villages, tribes and societies had their own twist to it. But where ever on earth you travel you will find traces of it. Not so far away in time, back in 1900 there where active shamanists among the common people in my home country Sweden and its neighbours Finland and Norway. I remember a film from Finland showing a man dancing with a bear hide over he’s body, much like American Indians or Africans shamans do. Now 100 years later, Finland creates Nokia phones and the last remains of shamanism are more or less gone. Still where ever you go. Shamanism is likely to have been there long before you. I noticed that when my friends in the folk music group Norrlatar (www.norrlatar.com ), toured the world. In Germany they played a great folk music festival in the late 80s. As they walked out on stage swinging the shamanic instrument we call “vinor” or “vinare” ( a spearhead like bone, wood or stone piece that is fastened in the end of a rope and swung around in a circle, above the head or the side of the body) one of the Aboriginal musicians that played at the same festival noticed this with great interest. After the gig he approached my Swedish friends, asking them if they been to he’s village ? The answer was “No” and my friends asked why he was assuming that. The Aboriginal man said “well you know how to speak with the spirits with our holy instrument. You must have learned that from our elders”. This was not the case. Norrlatar har learned that from the Sami people (http://boreale.konto.itv.se/samieng.htm) of course. So… even if Australia is said to have been isolated from the rest of mankind for about 40 000 years (a claim I doubt) the same instrument could be find in our local Same ( reindeer herder and relatives with American Indians) villages of the north of Sweden and in the isolated villages of Australia. And after some research I found out that this is the case wherever you go in the world.. this spirit contact instrument is found in Asia, Africa, America, Europe and Australia.. we all share the same common religious legacy. And common for all these was that no texts where written or “bible” was edited. It was all word of mouth and spoken traditions. This made the shaman ways very vulnerable to attacks from more organised systems. So during my second trip to Japan, it hit me that Shinto is in fact a religion with its roots in shamanistic beliefs, that has survived and raised to a organised level, where the other less organised shamanic traditions where erased by the powerful and well organised global religions of today. Outside a shrine I found a young well dressed man, in a perfect suit with a perfect hair due and a shiny suitcase, making video conversation over he’s new and cool NTT DoCoMo phone, Leaning towards a great three with Shinto folded white paper around its base. He had just come out of the shrine area after praying to the spirits. Now he stood by the tree with the great tree spirit within. Looking at him, I felt like looking at a Si-Fi scene from a movie. He was the pure image of the Japanese modern man, living a high tech IT life, leaning on a three where he obvious belived a great and honoured spirit lived within. It was in many way a beautiful scene. I feel hope for the forests and nature as long as people recognise that they are worth praying for. Maybe Japans Shinto belief one day will help them forward with environmental questions and the urgent matters that they and all of us are facing. Anyhow, Joi Ito, great that you took care of the old spirit in the three. I am sure that the spirit and its kodomos will honour you and your family by not letting the big three fall on top of your house. And if it does.. it only means it was a little to little sake in the ritual. Joi Ito - "Shinto ritual for pruning our Shii Tree" by Joi Ito is licensed under a Creative Commons Attribution 4.0 International License.